A Representation of the Surrender of the Island of Otaheite to Captain Wallis by the Supposed Queen Oberea, artist unknown, 1773, Princeton University. This exact scene is not described by Wallis. In fact, he was quite sick and weak when they arrived at Tahiti and did not set foot on the island until two weeks later. Seeing his condition, the queen ordered her people to carry him to her house, where young girls were instructed to massage his body. When he was ready to leave, the queen offered to have him carried again, but he refused and chose to walk. Even then, the queen took him by the arm and literally lifted him over areas of water or mud on the way back to the ship. 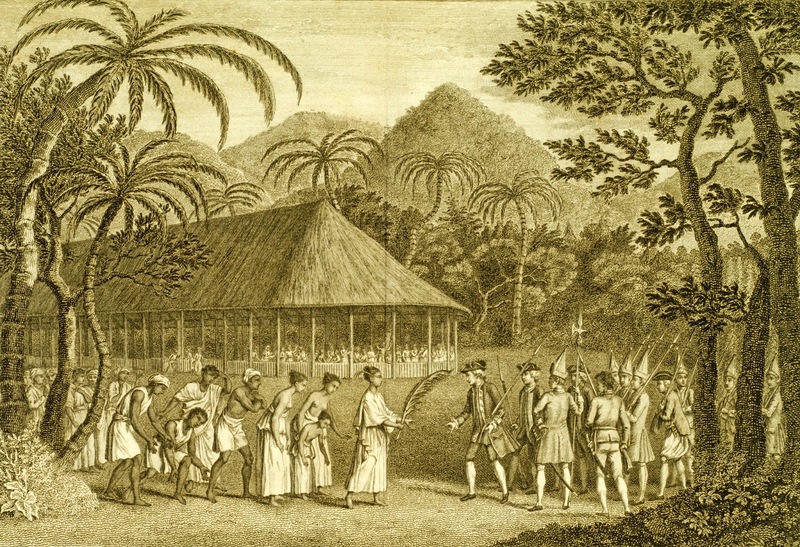 A party of marines accompanies Wallis on his expedition to meet the "supposed" Queen of Tahiti. Among their line is an uncomfortable looking sailor. The tar, bent under the weight of his musket, wears a cocked hat trimmed in white tape with the point forward. His short jacket ends at the top of the thigh, and is tucked back enough to reveal a belt with a pistol tucked inside. Slops are fitted over his breeches, along with white stockings.